As far as snacks go, I love dried fruit. Apricots were always a treat for me as a kid, then came medjool dates. Lately, my two favorites have been dried cherries and dried pears. But when I first became interested in cooking, many old French cook books stuck mostly to prunes (perhaps because I searched out the recipes with foie gras). Today, California prune growers are pushing the term "dried plum" into the American lexicon, as "prune" has some bad connotations. Whatever the name, prunes soon earned a spot in my regular working pantry. Carla hates the pits in some prunes. So I thought it would be a fun play on the dish to take out the pit and replace it with half of a walnut. I soaked the prunes overnight in hot water. 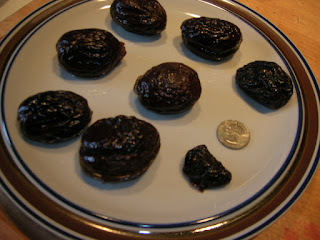 The above picture shows the six soaked prunes, one dried jumbo prune, a quarter for scale, and finally a "regular" prune (still special in its own right). I tossed the walnuts in a blend of walnut oil and dark honey to give them a bit of flavor, then rolled the stuffed walnuts in the leftover oil/honey glaze. 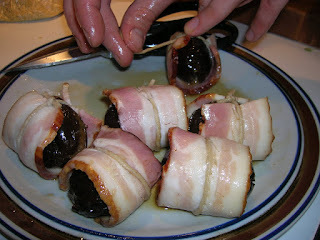 Wrapped in bacon secured with string, these little rumaki-style hors d'oeurves were ready for a hot pan. 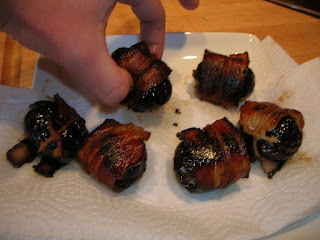 I should have thought that all the sugars in the glaze and dried fruits would affect the bacon. They still came out delicious--all hot, crispy, salty, sweet, soft and fruity, then with a little crunchy walnut in the center--but they were a bit dark. A well-timed splash of water in the pan saved them from getting burned, but something to keep in mind for future jumbo-prune endeavours.